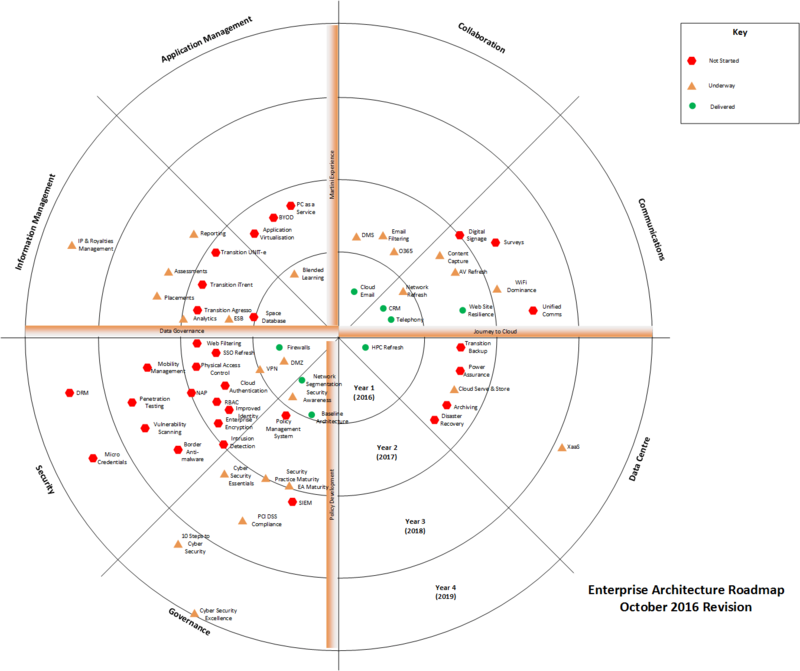 Following on from my post earlier this year the Plymouth University Enterprise Architecture roadmap has been updated and shown below. Although some good progress has been made over the past twelve months in networking and collaborative working including email, the focus of our priorities this year must remain around getting our house in order and migrating our services to the “cloud”. We must build on the good work already delivered and provide enhancements across the board. Security must remain a priority, particularly web and mail filtering, monitoring and logging, identity, authentication and authorisation are all key to continued forward momentum. The other area in need of attention is specific work surrounding data, including where it flows, how it is transformed and efficiencies therein; ideally precursory work to lay the foundations for an Enterprise Service Bus that will underpin business operations and meet aspirations and goals of many organisational units. This will greatly simplify our drive to deliver all of our services from cloud infrastructure, whether that be Infrastructure, Platform or Software as a Service. The full EA priorities roadmap document can be found here in our document library.